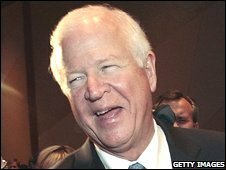 US Republican Senator Saxby Chambliss has won re-election in a run-off in Georgia, dashing the Democrats' hopes of achieving a "super-majority". They have 58 Senate seats, but needed 60 to stop any Republican attempts to block legislation with a "filibuster". The only undecided state is Minnesota, where a recount is under way. Mr Chambliss and his Democratic opponent were forced into a run-off after neither reached 50% in a three-way race during November's election. The Democrats won expanded majorities in both the House of Representatives and the Senate, and their candidate, Barack Obama, was elected president. During the campaign, Mr Chambliss promised voters he would act as a "firewall" against a Democrat-controlled Washington. The Democrats already have 56 Senate seats plus two independents who have promised to vote with them.